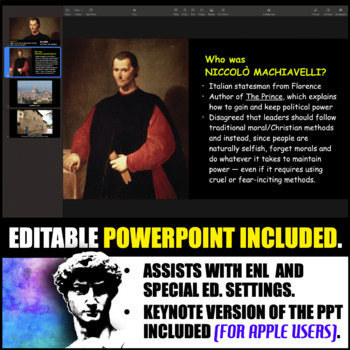 How did Machiavelli's The Prince influence modern political thought? 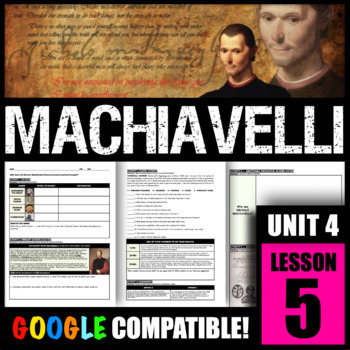 ACTIVITY 1 -- DO NOW: Students will complete a survey to find out if they could be described as “Machiavellian.” They will place the number fitting their opinion on the line next to each question. Then, they will tally up their numbers to see what their score is -- and see which historical figures might fall under a similar category. ACTIVITY 2 -- PRIMARY SOURCE ANALYSIS: Students will analyze excerpts from The Prince and explain what the excerpt means. Then, they will read a scenario and determine how Machiavelli might respond to that scenario based on the excepts. ACTIVITY 3 -- ASSESSMENT: Students will choose an option for assessment to complete on looseleaf. ASSESSMENT: Students may complete an activity for assessment, or answer the AIM using the R.A.C.E.S. 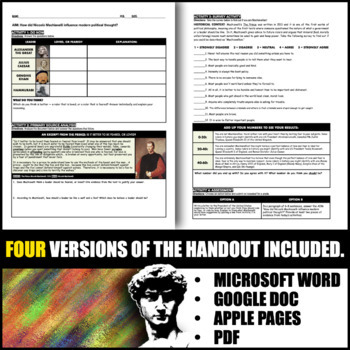 format (FREE Download Here).